FATE isn't a complicated tabletop system, and while their claims that it "gets the rules out of the way" are frankly untrue, it is on the "rules-light" side of gaming. But just because there aren't many rules that doesn't that those rules aren't complicated or difficult to master. For anyone (Player of Game Master) coming from a traditional tabletop RPG, the strangest mechanic to get used to is that of Aspects and FATE Tokens, and frankly they are the meat and potatoes of the FATE System. Everything that the players interact with in a FATE game have what are called Aspects. As much as these serve as descriptors for the area/character, aspects are also pieces of information that the players and game master can interact with by spending/assigning FATE Tokens. 1) He doesn't want to be a wizard but is. 2) He is not from the area we are playing in. 3) He is out of shape. Elijah, the Game Master, could invoke one of Dave's Aspects by giving him a FATE token (we use giant checkers pieces); this would force him to get into trouble by acting upon his aspect. So for example, if during a chase Elijah invoked Dave's aspect "I need to Hit the Gym" then Elijah would give him a FATE Token; asking Dave to roleplay appropriately. Dave could spend one of his FATE tokens to ignore this effect, or could accept the FATE token and go along with him being tired during the chase. 3) Run by the Mob. And was approached by two mob thugs, Dave could spend a FATE token and invoke the Aspect of the Bar being "Empty" to change the scene so that there is only one guard who approaches him, rather than two. 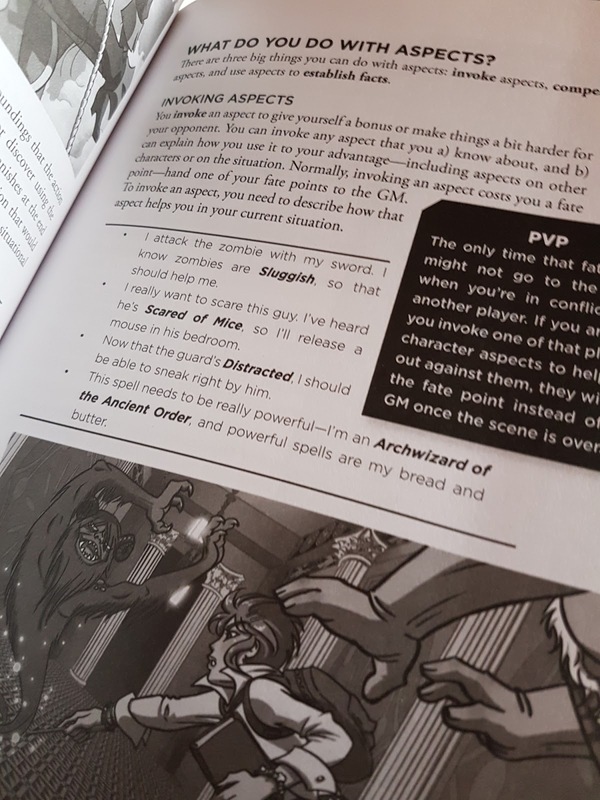 A Small example, but players can spend their tokens to use the Aspects however they imagine (and the GM approves) to change the scene, hopefully to their benefit. This is not as easy as it sounds, particularly for the Players as it feels like you are both playing and hosting the game. In order to appropriately use the aspects, you need to be hyper aware of the scene and the mechanics that are going on around you. Otherwise you will not know what Aspect to invoke or how to modify the scene. So it feels like a lot of work and creative GM-Style thinking while you are a player. As Game Master you really feel like a referee, as the players take the aspects and begin to form their own stories out of them. So your job is to be fair and make sure that the players aren't changing things too much in their favour. You also need to of course lead them on an adventure, and to create scenes and characters with invokable Aspects. It took us as a group around five games to get used tot he FATE Token and Aspect system. Along the way we learned a couple things as well, like the importance of actually having something for the Tokens rather than just keeping a tally (it is easier to remember to use them) and to display the aspects of each scene/character on a white board so everyone can see what they have to work with. It's not perfect, but it's getting there. 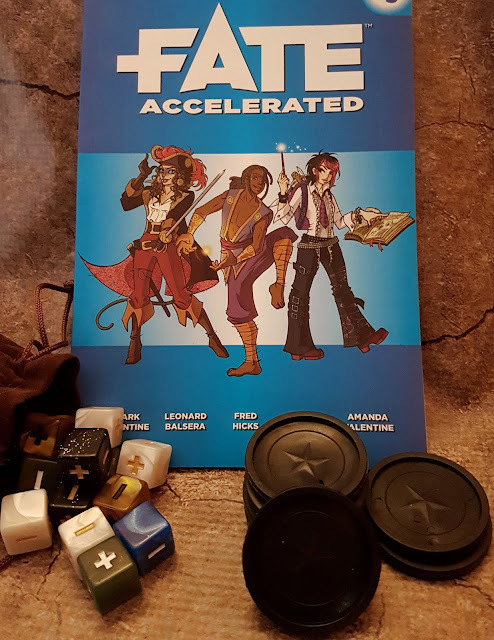 Have you used the FATE RPG System? How did your group find using Aspects? Let us know in the comments below.